I have most of these on vinyl (photos below are from my collection unless otherwise indicated). But the audio comes from persons unknown who have shared the sound files. For the record (pun! pun! ), I don’t condone piracy: I’ll only seek a “bootleg” copy of song if it’s unavailable commercially. As always, if you are the owner or if you represent the owners of this material, just ask and I’ll take it down. 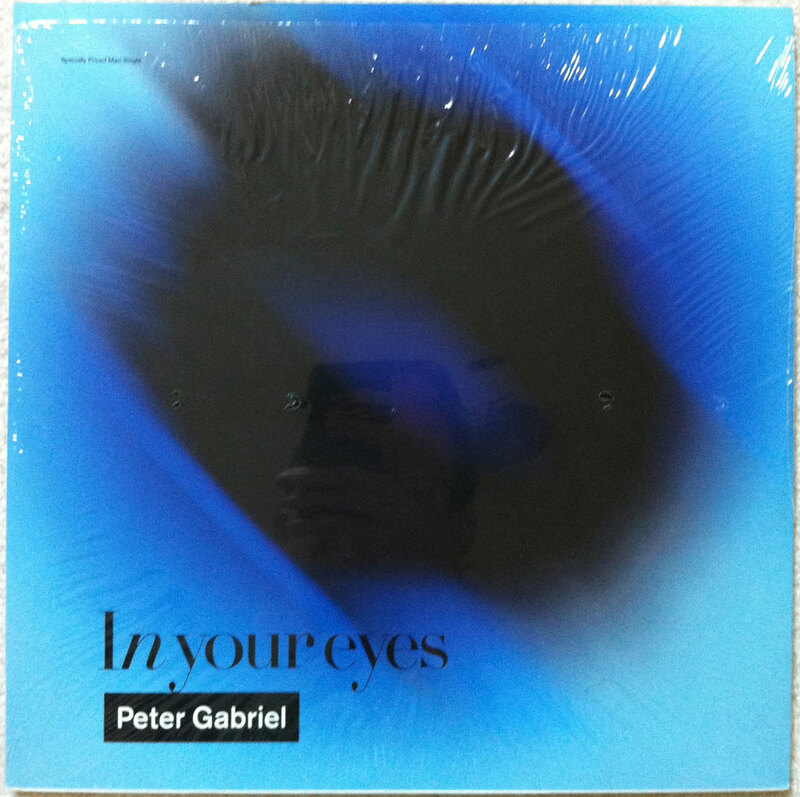 Let’s start with the best unavailable song: Peter Gabriel’s “In Your Eyes (Special Mix)” (1986). Here is an 8:20 version, which is longer than the 7:14 on my 12-inch. With the exception of the extra minute, both of these versions are very similar in that they’re a vastly different version of Gabriel’s original — a new arrangement, with much more of Youssou N’Dour’s vocal. 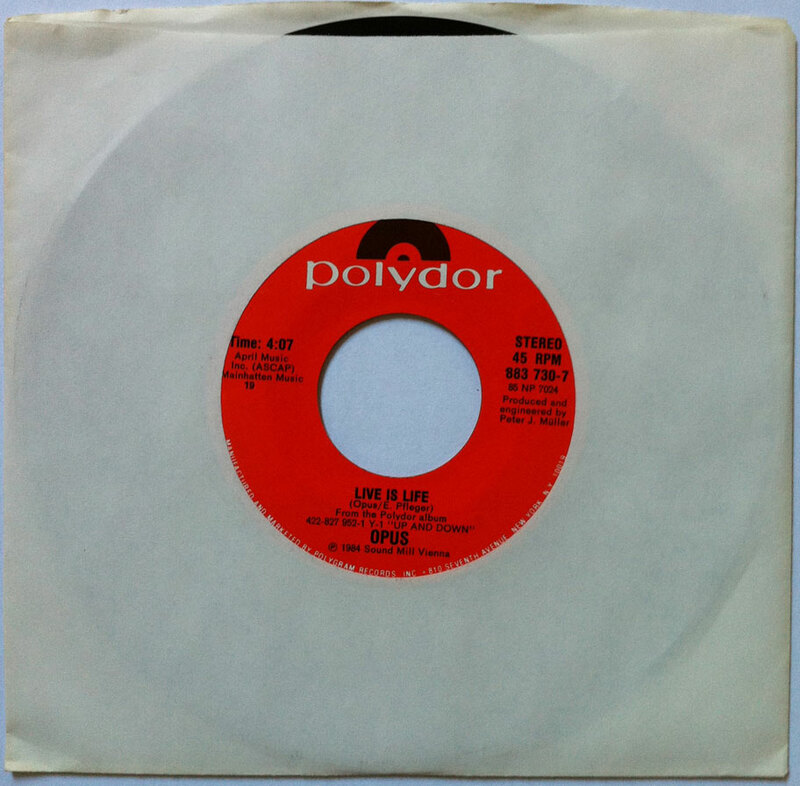 The 7:14 version is also available as a b-side to the original single. 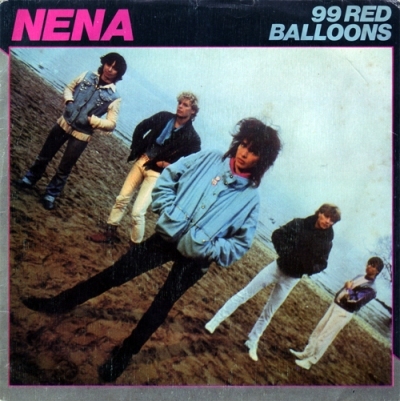 Nena‘s original “99 Luftballons” (in German) can be found on the CD of the same name, along with a remix of “99 Red Balloons” (in English) — but, oddly, the original English version is not to be had. Perhaps this can be had in Australia (the band’s home), but it’s out of print here in the States. At the time, I liked the song (I own the original 45) even if it sounded a bit like an INXS knock-off. Now, however, this Models song sounds like a lost INXS classic. Time has shifted my aesthetic evaluation, or perhaps I was unfair to the song when it was first out. The video (below) reflects fashions I would have thought were hip in the 1980s and which now look like… they were hip in the 1980s. Um, yeah. The Australian rock stars just before they became superstars. From the 12” of “What You Need,” here’s a very 1980s remix by Nick Launay. I enjoyed it just as much as the original version, which was a top #5 hit in the U.S. It (the original) appears on INXS‘s Listen Like Thieves. The title track only made it to #54 on the U.S. pop charts, but their next album would yield four top ten singles in the US. That record was, of course, Kick. A big hit in Europe, and a smaller hit in the U.S. — made top 40 over here, but Opus‘s song topped the charts in France, Germany, Sweden. Like Nena’s hit, the German version of Peter Schilling‘s song is readily available. The English version is not. A sequel to David Bowie’s “Space Oddity” (1969) and “Ashes to Ashes” (1980), “Major Tom (Coming Home)” appears on Schilling’s record Error in the System. Blue Clocks Green‘s song was on college radio, and (I think) a club hit. A cheerful “new wave” pop tune with a dark lyric about Hemingway’s suicide. This is the closest to the “American Version” of Falco‘s song that I can find — it’s about a minute and a half longer, but it includes the spoken-word narrative of major events in Mozart’s life, and the other elements of the American release. And, yes, the video is as ridiculous as the song. The b-side to the 12” single, this is not strictly instrumental. 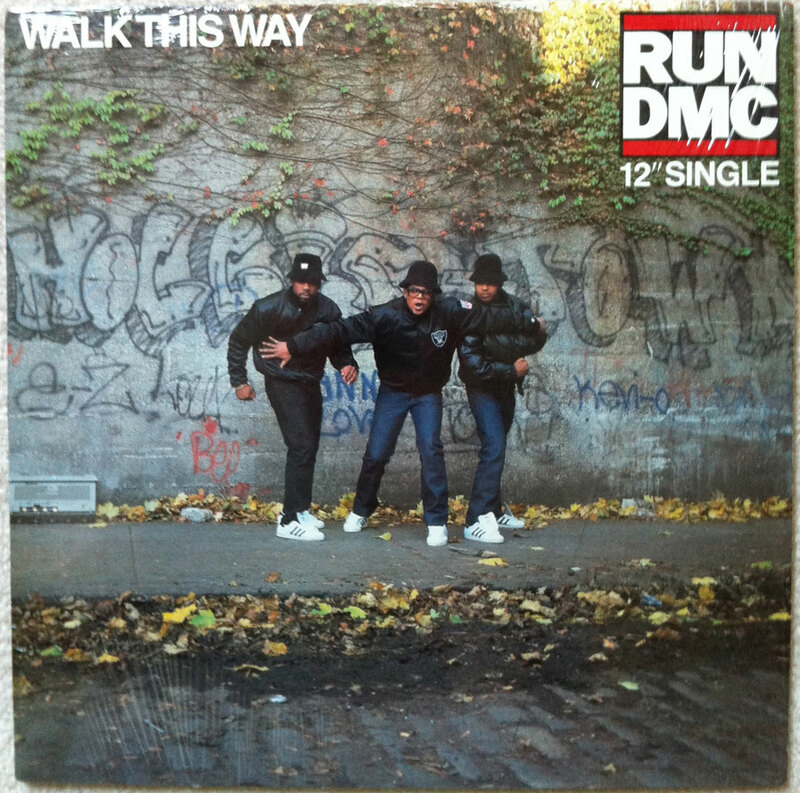 It’s absent RUN-DMC’s vocals but does include Steven Tyler’s vocal. On the original record, the inner groove had just the beats. So, when the needle reached the end, it simply repeated those beats endlessly. And who can forget the video? Well, that was fun. Perhaps, in another post, I’ll share other forgotten (but still available) music from the 1980s: Big Pig, Royal Crescent Mob, Toni Childs, David & David, Screaming Blue Messiahs, Red Rider, and so many others…. Image credits: from my record collection except for Nena (Wikipedia). I’m always annoyed, as a non-German-speaking person, to hear “99 Luftballons” instead of “Red Balloons,” because if you can’t hear what the song is ABOUT, then it’s just a perky dance number, but WITH the words it’s a perky dance number ABOUT NUCLEAR ANNIHILATION, which is just awesome. I am sad that it is no longer available. I have an mp3 of it that must have been aquired illegally at some point, and for awhile I was afraid I’d lost it when my computer was having issues. Funny how traumatizing the thought of losing it was. I stumbled upon this post looking for more information about the Hemingway song. From this post alone, I have to guess you are from Rochester, NY or spent some time there. Am I right? I can’t imagine anyone knowing about this song any other way. I graduated from U of R in 1995. I have to agree with rockinlibrarian…your blog kept my attention and I poked around more than I usually do. A friend of mine has a book blog and she loves children’s literature. I think she’d love your blog, so I’ll share the link with her. I enjoyed your posts about what professors do all day, since I’m interested in time management and I’m nosy. Although I must confess I’m a little jealous about some of the things you can count as “work.” Perhaps I’m in the wrong line of work. Tracy: You have guessed correctly! I lived in Rochester at the time “Hemingway” was popular. I graduated from the University of Rochester in 1992. Regarding the “What Do Professors Do All Day?” posts: the main theme, I think, is that there’s not a clear boundary between “work” and “life.” Sometimes, this is a great thing. Sometimes, it isn’t. Hey, thanks for the return visit to my blog! Glad to “meet” another UofR graduate. I believe you’re right about work. I definitely want a clear boundary between my current job and my life! Not big on commenting but wanted to that you for you Mp3’s, like you and Tracy I am a from the Rochester area around the same time, though I graduated from a local high school in ’96. I have been looking for Hemingway Mp3 for about a month when I found your site, thanks for all the extra memories contained within. Former Rochester DJ from the early 90s here! Yes we played that song often at WBER–we even had a promo for our station with the song in the background (a slightly different version with a longer intro than this one). Ah this catchy tune brings me back to the good old days of college radio before “alternative” changed everything…. UPDATED 9/10/13 – Blue Clocks Green Digital Only Release Coming October 15th to iTunes, Amazon etc etc. FEATURES ALL VERSIONS AND REMIXES of HEMINGWAY PLUS NEVER RELEASED SONGS FROM THE 80s. After 25 years Blue Clocks Green finally release their 80s underground cult hit Hemingway. Digitally re-mastered for download, the singles Hemingway and Save Yourself Then The World, along with remixes and other unreleased tracks are available for the very first time. This release marks the beginning of a revival of activity for Blue Clocks Green with new songs and projects in the works. The duo aka Lange and Michèle formed Blue Clocks Green as an experimental performance art project after meeting in an art history in college class in the early 80s. Soon afterwards, Blue Clocks Green took to the stage with an all-electronic sound, backed by a stage show built as an art installation. The performances featured featuring: music, spoken word, original videotape movies, slide projections, multiple record players featuring recordings of dialogue, TV’s displaying static, and ready-made objects of art. 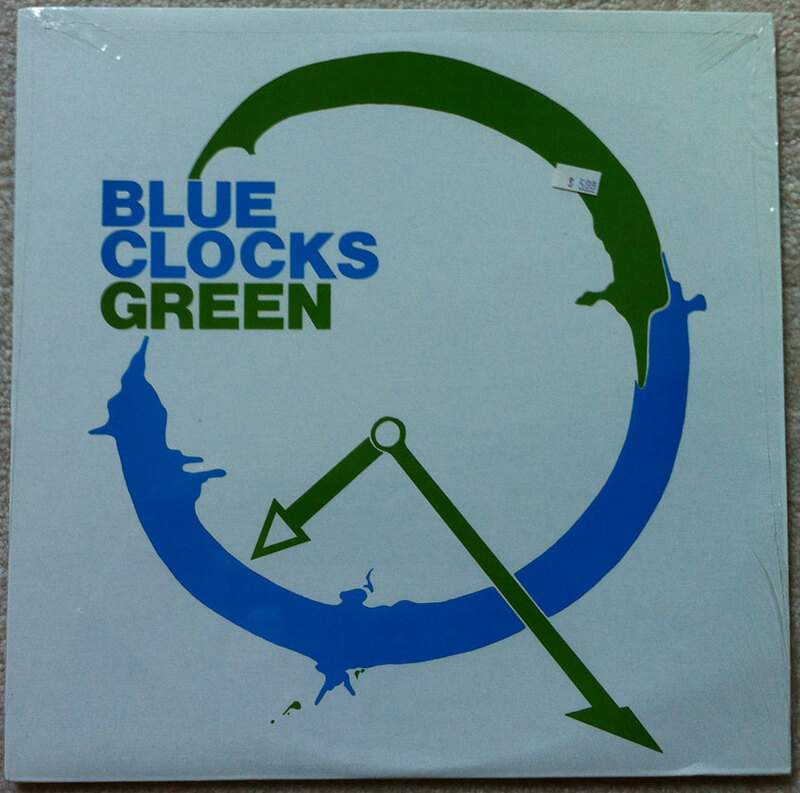 In 1988 Blue Clocks Green released their first 7 inch single called “Hemingway” The minor success led them to remix the track and release it as a 12 Inch version with various mixes. The 12 Inch Single of “Hemingway” received airplay on over 150 college and alternative radio stations throughout the US and went number 1 and top ten on several dozen. Additionally, the song became a hit with the dance crowd at several alternative clubs throughout the US. But do due the graphic lyrics, the song was banned by some college radio station administrators, which ironically established and solidified Hemingway as an underground cult-classic. A follow-up single, “Save Yourself Then The World” was released on vinyl in 1990. The song received considerable airplay, but with no official album out, the band fell under the radar of record execs now looking to capitalize on the new grunge sound exploding out of Seattle. After 1990, the duo stopped recording and performing as Blue Clocks Green, but neither member stopped creating. Blue Clocks Green are recording new songs and plan on releasing them 4 at a time as EPs. Thanks for the link to Peter Gabriel’s Special Mix of In Your Eyes. Hard to find this amazing version. The American version of “Rock Me Amadeus” was recently re-released and can be found on Spotify, etc. The missing English version is a bigger deal for Peter Schilling than for Nena. It was the English version that went to Billboard Hot 100 #14 in the US. But for “99 Luftballons,” the English version did not chart and the German version was actually preferred. Nena was known to actively despise the English version because the original has no reference to color. At any rate, it was the German version that charted at #2 in the US. Not so with “Major Tom,” but the German version is excellent and closer to familiarity than the stupid uber-techno 1994 version that’s easy to get.